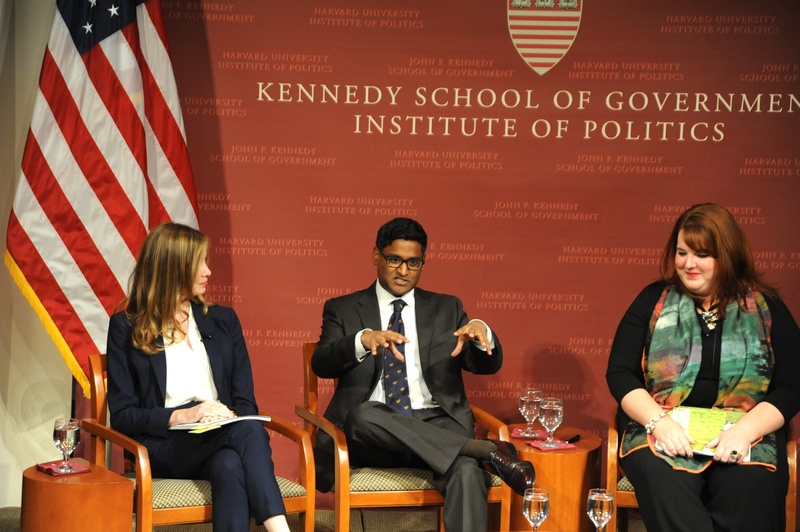 Ramesh Ponnuru, center, shares his definition of reform conservatism with the attentive crowd in the JFK Jr. Forum at the Harvard Kennedy School of Government on Thursday night. Leading reform conservatives or “reformicons” April Ponnuru, Ramesh Ponnuru, and Pete Wehner discussed the future of the Republican Party and the need for a more substantial party platform at the Institute of Politics on Thursday. The John F. Kennedy Jr. Forum event, moderated by Fall 2014 IOP fellow Kristen Soltis Anderson, discussed policy solutions for appealing to middle-class voters and examined actual and possible candidates and issues for the upcoming 2014 and 2016 elections. The panelists also discussed the party’s prospects in the upcoming 2014 elections. Anderson expressed her concern over a strong Republican midterm victory, noting that the “election is an election about nothing” and that such victories would just be another set of “false positives,” like the races in 2010. Ramesh Ponnuru added to the midterm discussion, calling the current situation an “odd political moment.” He noted that Republicans were “bank[ing] on just the unpopularity of the President” to win, while it would probably be much more meaningful to focus on and build a serious agenda surrounding issues like healthcare and education. The panel concluded with a discussion of the 2016 presidential election and the importance of reaching out to minority voters. Ramesh Ponnuru emphasized the need for a broad economic platform that would appeal to the entire electorate without necessarily focusing on “group-specific appeal.” He also stressed that even a 5 or 10 percent increase in the minority Republican vote would be crucial to future elections. Daniel V. Banks ’17 disagreed with the catch-all policy Ramesh Ponnuru described, stressing the importance of conservative principles that go beyond just the economy.